Previously on Once Upon a Time: A Land Without Magic. This week on Once Upon a Time, magic is here! This curse is broken, the citizens of Storybrooke remember who they are, and Mr. Gold’s strange brand of magic is unleashed upon the town. As Emma and the others try to decide what to do with Regina, Mr. Gold sets his own revenge plans in motion – with unexpected results. Meanwhile, we are introduced to some new faces in the Enchanted Forest, where everything is not as it seems. In New York, a mysterious man (played by Michael Raymond James) returns to his apartment. A dove flies to his window with a postcard from Storybrooke bearing one word – broken. In Storybrooke, the ominous cloud unleashed by Mr. Gold washes over the town, though no one seems negatively affected. Charming and Snow tearfully embrace their daughter for the first time in 28 years and I’m already reaching for the tissues. Before they can even begin to untangle their emotions, the Mother Superior informs them that magic has returned, and Archie warns them that Dr. Whale is leading an angry mob to Regina’s. 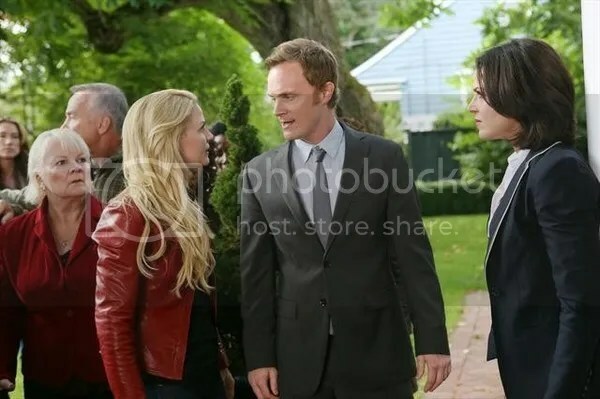 Emma and her parents arrive just in time to rescue a powerless Regina from the mob’s wrath and drag her to jail. Meanwhile, Belle tells Mr. Gold of her imprisonment at Regina’s hands and makes him promise not to kill her. He takes this promise literately and instead summons a wraith to do his dirty work for him. Ms. Blanchard wants to get to know her daughter, but Emma is struggling with her own feelings of abandonment. They confront Mr. Gold about the magic he released, but he argues that he’s done nothing wrong. Before they can glean anything more from him, the wraith makes its presence known in Storybrooke. Emma insists they’re not done; Mr. Gold reminds her she owes him a favor. Belle expresses her disappointment in Mr. Gold’s lie, though she stays with him in the hope he’ll become a better man. Emma, Ms. Blanchard, and David fend off the wraith attacking Regina, but the only way to stop it is to send it elsewhere, via Jefferson’s hat. They set a trap for the wraith, but Emma gets sucked in too. Unwilling to lose her daughter again, Ms. Blanchard follows her in but David is too late. Upon learning what happened, Henry refuses to talk to Regina until she brings them back. David takes his grandson takes his grandson home and promises to find them. In the Enchanted Forest, a prince and a masked warrior ride through a barren wasteland. They reach a crumbling palace, where Princess Aurora (played by the incredibly gorgeous Sarah Bolger of The Tudors fame) lays sleeping. Prince Philip promises to tell his beloved “the truth” upon her awakening. His kiss breaks the curse, but before he can share the whole story they are attacked by a dark creature. They fend it off, and in the aftermath the warrior reveals her identity – Mulan (played by Jamie Chung of Real World fame). She explains that they were attacked by a wraith, a soul-sucking creature that marks its victims. Though they appear to be unscathed, Philip hides a mark on his hand. When the three stop for the night, Philip sneaks off to meet his fate. The women realize the truth and head after him. They reach him just in time to watch him fall victim to the wraith. The two lay Philip to rest at the palace, and Mulan reveals the whole truth – that a curse swept almost everyone away 28 years ago, except for a small corner of the land where they remained frozen until recently, when the curse weakened. Before the two leave for the safe haven, they hear a crash and discover Emma and Ms. Blanchard. • Just when we thought everyone was going to be brought together, they’re torn apart yet again. 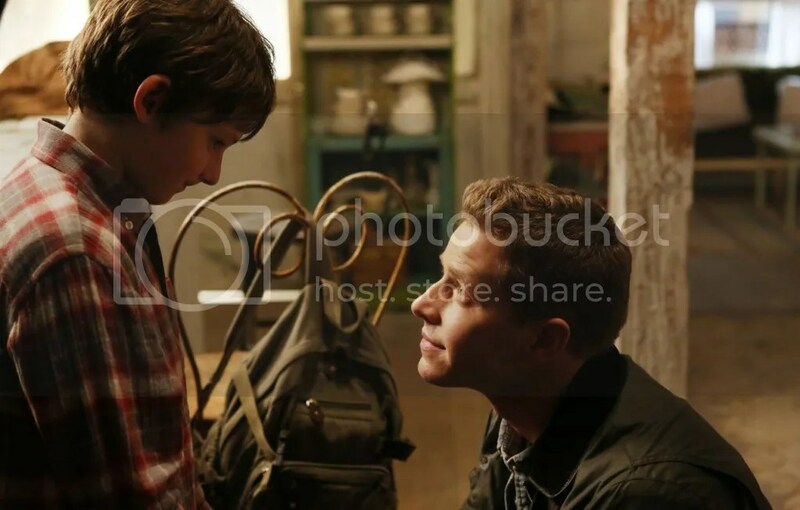 I commend the writers for keeping the two storylines relevant and interconnected now that curse is broken, plus Ms. Blanchard and Emma need some time one on one to work their feelings out, but at the same time – ARGH! • The mysterious man from the beginning of the episode has to be Baelfire, right? • Interesting that Regina’s magic didn’t seem to work until Emma touched her. Wondering what the significance of that is. • WHO IS WHALE? No one seems to know. There was an intriguing undercurrent to his interaction with Regina this episode, and I want to know more. The mystery is killing me. Nicole N. decided to justify the countless hours she spends watching television by writing about it here. She is currently indulging her addiction to medical dramas by rewatching all of Grey’s Anatomy. Follow her on twitter @nicolemnelson and check out her tumblr.